National Woman Suffrage Publishing Co.
A prototypical promotional map of the woman's suffrage movement in the U.S., using the spread of suffrage across the country (or in this case, North America) to "prove" the "success" of votes for women. The use of maps like this to "brand" the suffrage movement effectively has been called "the most extensive use of a single iconic map image for persuasive purposes in the United States." (Dando 2010, 222). The suffrage movement, founded in 1848, had lost momentum by 1900. Only four states had given women the right to vote: Wyoming, Colorado, Utah and Idaho. But with the turn of the century, new leadership came of age in the movement and with it new tactics to reach a broader audience: parades, rallies, speeches - "from the parlour to the streets." (Ibid. 223). In December 2007, Bertha Knobe published a "Map of the United States Showing Status of Woman's Suffrage Legislation" in Appleton's magazine. It was promptly reprinted in The Woman's Journal on January 11, 2008 (Ibid. 222-24) and again on January 23. ID # 1165 "Women and the School Vote". A version appeared in Harper's Weekly in April, showing women's rights to vote around the world (ID # 2089). In these first maps, the states that had adopted suffrage were colored black and the others white (or gray, in the case of partial suffrage). By 1911, the colors had been reversed. See ID # 1169 (Rembaugh). 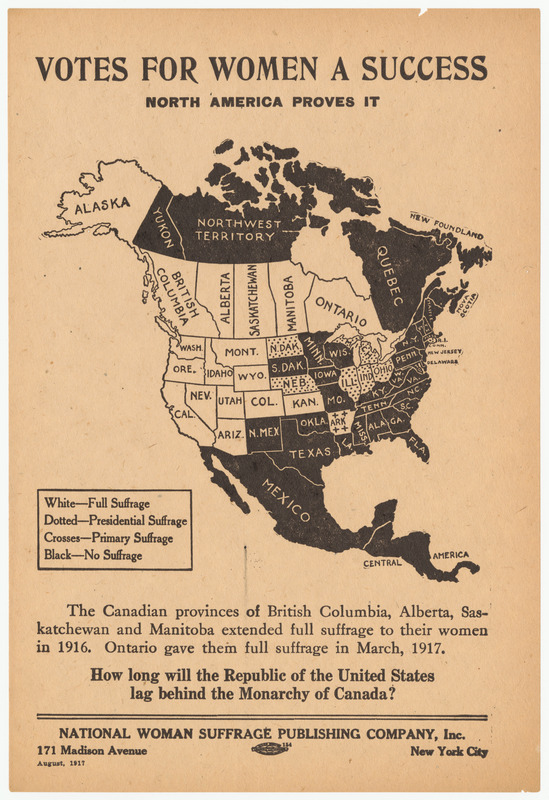 "As a result, the map offers a visual form of the suffrage argument that the vote emancipates women (white associated with purity, virtue, freedom) while the lack of full emancipation keeps women shackled and 'in the dark' (black as uncleanness, unclarity, slavery)." (Dando 226). Knobe said in 2008 that "I hope everybody in the country will assiduously take to the making of suffrage maps, for it is a most effective way to advertise the cause." (Ibid. 224). She got her wish|"I cannot imagine a single map that was produced, reproduced, or displayed as much as the suffrage map." (Ibid. 235). The map was used in billboards, posters, parade floats, pageants, silent films, window cards, newspaper ads and articles, paper fans (35,000 during the unsuccessful Empire State campaign of 1915), calendars, and items targeted specifically at men such as drinking glasses and baseball programs (Ibid. 227, 232-34). See, for example, ID #1173 "Stationery logo 1913"|#1177 "Poster stamp 1915"|#2014 "Speech by male supporter 1916"|#2100 "Postcard 1917"|#1207 "The Woman Voter and the Next President" 1919. It became "so pervasive in the American landscape that writers and speakers could refer to it without its being present." (Ibid. 228). The suffrage map was so successful that ​the cost of reprinting ​it caused serious financial problems for the national movement, because every time a state granted additional voting rights for women, supporters demanded updated ​versions (Dando 227-28). And it was so successful that the National Association Opposed to Woman Suffrage reprinted and attacked it on its own broadside! (ID #1171 "Population Votes - Not Area"). For a particularly dramatic use of the suffrage map, see ID #1176 "The Awakening". For full details on references, see http://persuasivemaps.library.cornell.edu/content/references. For important information about copyright and use, see http://persuasivemaps.library.cornell.edu/copyright. This is a collection of “persuasive” cartography: maps intended primarily to influence the opinion of the viewer -- to send a message -- rather than to communicate geographic information. The collection reflects a variety of persuasive tools: allegorical, satirical and pictorial mapping; selective inclusion or exclusion; unusual projections, graphics and text; and intentional deception. Maps in the collection address a wide range of messages: religious, political, military, commercial, moral and social.